Suspended ceilings, also referred to as drop ceilings or false ceilings are a secondary ceiling, hung below the main structural ceiling. In commercial buildings, suspended ceilings can be used to obscure the pipes, wiring, light fixtures, sprinkler heads and ductwork. Because the tiles are easily removable, it is still possible to access mechanical and electrical equipment above the ceiling for maintenance and service. Suspended ceilings can control noise distribution throughout the office. The acoustic performance of suspended ceilings has improved dramatically over the years, with enhanced sound absorption and attenuation. As a general rule, the thicker and denser the ceiling panels are, the better their ability to absorb sound and keep adjacent rooms quieter. The majority of suspended ceiling systems are made up of steel grid and acoustical tiles, though other materials can also be used. The tile is often made up of mineral fibre or mineral wool. These materials are relatively easy to work with and install, and they provide the right levels of thermal insulation, saving on your energy costs over time. The materials used in suspended ceilings tiles also have a good level of fire resistance as well as being resistant to humidity and different temperature changes e.g. when heating systems are turned off and on. Anti-microbial tiles can be applied where cleanliness and hygiene are of uppermost importance, such as in hospitals and kitchens. Trevor Blake are able to provide help and advice when choosing the correct ceiling to suit your needs in terms of aesthetics, acoustics and budget. 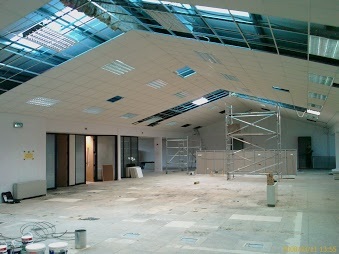 Our design and installation teams specialise in the complete design and installation of all types of suspended ceilings. Contact us for more information or a no obligation quote on 01293 775 509.